There are times when despite all our efforts, things come only so far because of unrepairable damage or we started too late. There are many variables and each horse is an individual. The goals must be realistic and unselfish. Some of these horses never went back to work or even became totally sound, but they have served our human desires, and some of these owners I admire tremendously who took seriously their committment as caregivers for the life of their horse! 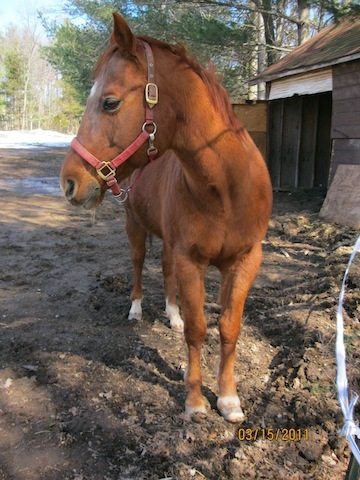 Levi was a 17 y/o grade gelding who had been lame for many years. Unofficially diagnosed as navicular, and shod with aluminum bar shoes...and still very lame. He had many problems besides his feet- a dropped back, saddle damage, was unable to engage his hind end, so he began to pull himself with his front instead of pushing his body forward from the hind. He was very heavy on the forehand and very overdeveloped in his trapezius muscles. With a diet change, mineral supplementation and help from the holistic professional team with natural balance dentistry with Wendy Bryant, Chiropractic/ Acupuncture with Dr. Carlos Cortlezzi, Therapeutic Massage with Connie G, and owners who really get a high five for doing everything possible to help Levi, we have together brought him to a place where his life has been turned around. Many have said, he is a very lucky horse. He resumed light and then moderate trail riding with EasyCare padded hoof boots. Mister taught me that although the foot you see above looks really good compared to what he had when I met him, looks did not function well for him. I watched the video I took of him over and over. I could see that his joint had no motion and that he was more comfortable rocking back on his heels. After much thought, I decided to try and shape his foot like a rocking chair to see if that would give him some motion and improve his way of moving. It looked funky- not as nice as the foot after the second trim, but it really worked well for him. He was even able to trot! Not sound or even graceful, but for him it worked. I have to say that he had a great attitude through this whole process.﻿ I knew we were not going to fix or cure anything. Did I help to improve his quality of life? yes- and that was the goal. He did begin to abscess in 3 locations as the structures that fell out of alignment within his foot continued to deteriorate. He was humanely euthanized summer of 2012. I am thankful for the opportunity both he and his owners gave me to learn some valuable lessons that I can take to other horses. Will this ever look like a normal foot? 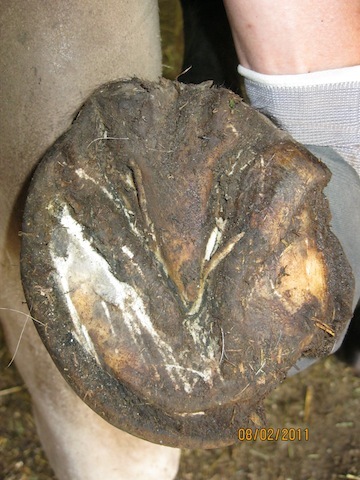 probably not, but the foot has tightened up quite a bit, and we saw healthy horn growing from some of what was once unrecognizable. There was a lot of damage here, but she was pasture sound, and was not when I first met her. An interesting note here is the overlaid bar and thickened sole on the side where you see my glove- I see this as an adaptation or a part of the foot stepping in to support her where the wall has failed. As long as I left it alone, she was sound.